It is something of a paradox that while two generations of young music fans a decade or so apart have cut their rock 'n' roll teeth on a couple of distinctive songs, and the perpetrators of the pop cover versions have been accorded near-legendary status, the artist responsible for the originals is still only recognised for her talent mainly by specialist cognoscenti. 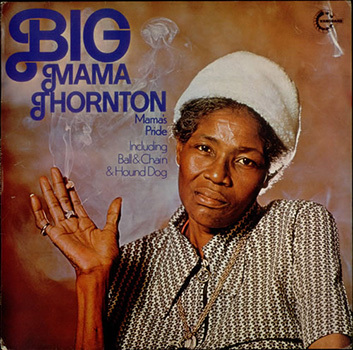 The songs concerned are 'Hound Dog', which helped to established Elvis Presley as a major star in 1956, and 'Ball And Chain', featured in the repertoire of Janis Joplin with Big Brother & the Holding Company in 1968; the lady whom the spotlight seems to have missed is the somewhat imposing figure of Willie Mae 'Big Mama' Thornton, a powerful-voiced blues belter who often draws comparison with such contemporaries as Dinah Washington, Ruth Brown & Big Maybelle, Etta James & Linda Hopkins, following the tradition of Bessie Smith and Ma Rainey. Willie Mae was born in Montgomery, Alabama, on December 11 1926, gaining her musical grounding from a religious background - her father was a minister and the family was obliged to sing in his church. She had to start working for a living at the age of 14 when her mother died, but after singing one night at a local bar she promptly left home to tour around the south as a member of Sammy Green's 'Hot Harlem Review', imbibing the musical influence of Bessie Smith and Big Maceo, but developing her own playing talent on harmonica and drums. She remained with this show until 1948, quitting in Houston intent on making her mark on the local music scene, and cutting her first disc around 1951 for E&W Records, featuring as singer with the Harlem Stars. This prompted interest from Don Robey, who soon signed Willie Mae to his Peacock label, and following a couple of Houston sessions Big Mama trekked west in August 1952 to record with the Johnny Otis Band in Los Angeles, whence came her original version of 'Hound Dog', a gritty, sparse blues shout before being transposed into a torrid rocker by Presley, which aspired to spend 6 weeks atop the R& B charts in spring 1953 (legend varies between the song being written on a paper bag by Leiber and Stoller, and that duo buying it in such form from a bar wino). Big Mama then toured with the Otis Show while maintaining a steady output of local hits on Peacock, but on arriving back on the west coast during a tour with Gatemouth Brown late in 1956, she decided to settle there, ending her link with Robey, and her next disc appeared on Oakland's Bay-Tone label in 1961, at which time she wrote the searing 'Ball & Chain' anthem. In 1964 Willie Mae appeared at the Monterey Jazz Festival, on the instigation of Arhoolie Records' Chris Strachwitz, gaining great acclaim and a contract with Sotoplay Records yielding two 45s. Another appeared on Kent before Big Mama set off to tour Europe in 1965 with Horst Lippman's American Folk Blues Festival; 'Hound Dog' was recorded in Hamburg as her contribution to the Festival LP on Fontana, then Strachwitz cut a whole album on the lady in London for Arhoolie with such illustrious support as Buddy Guy, Eddie Boyd, Walter Horton, Fred McDowell and Fred Below. A further Arhoolie LP was cut in San Francisco in 1966 with Muddy Waters, Otis Spann and James Cotton, and a third set followed, featuring a paramount performance of 'Ball & Chain', before Big Mama was signed to Mercury in 1969, whereupon her 'Stronger Than Dirt' LP was a potpourri of blues and soul, and the early 1970s saw her drift on to cut a gospel LP on Petragram, while Backbeat issued a 'She's Back' set, and a solitary 45 appeared on Carolyn. In 1975 Willie Mae 'Big Mama' Thornton signed with Vanguard, and this album culls the cream of her two LPs, in different styles and situations but similar artistic merit, previously unissued in the UK. It's a physically slimmer version of the massive lady who'd scared the wits out of the not unimposing figure of the late Howlin' Wolf, but her voice lacks none of the power of her earlier years. Side One is extracted from the second Vanguard LP 'Sassy Mama', recorded in the company's New York studio with a fine combo of established sessioneers, producing a clear, strident sound, musically strong if regimented. 'Rolling Stone' becomes an engaging loose blues ramble reminiscing on her European trek, while Lost City' is crisp and intense with strong sax by Buddy Lucas. Mr Cool' builds in simmering fashion on a backdrop of mellow organ and sax, with Cornell Dupree's guitar adding shades of T-Bone, and 'New Love' adds a funky dimension to proceedings, keyboards well in evidence upside a strong bass line from Wilbur Bascomb (who gained some solo repute in the jazz-funk field early in 1978), while 'Private Number 'hits a fine, brooding melancholic groove, Big Mama dominant over brief features by Lucas, Dupree and rippling Griffin piano. Side Two, the best of her 'Jail' set cut live in Monroe, Washington and Eugene, Oregon prisons, presents Big Mama in the context of a Chicago-style blues unit including veteran harpist George Smith and stalwart pianist J. D. Nicholson, really cooking on the jumping 'Rooster' and 'Hound Dog', and pouring every ounce of blues feeling into the searing 'Ball & Chain', with strong, sympathetic sax and guitar, and melancholy 'Jail', with more superb guitar by Bee Houston adding a Texas tinge to the sound. Thus you are here presented with a striking set of rhythm & blues by a lady whose voice can hardly fail to leave an impression on your aural senses!